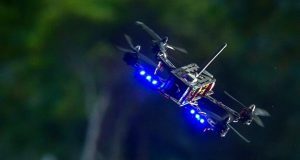 The MultiGP Drone Racing 2018 Regional Series season opener is drawing closer. We thought this would be a could time to go over some of the changes in the qualification process and regions for the 2018 season. The MultiGP Regional Series regions have been restructured to now consist of six major regions. Pilots must declare the region in which they plan to compete. All qualifing attempts must take place in the declared region. You must compete in said region for the entire year. A pilot does not have to live in their selected region. Pilots are not limited in number of Regional Qualifiers they can compete in within the declared region. 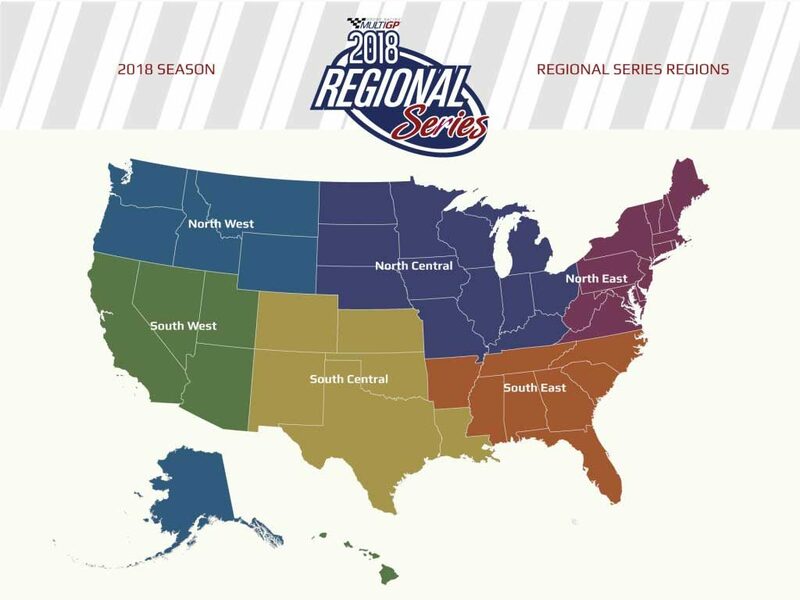 With the start of the 2018 season the Regional Series will have six Regional Finals. One for each region. These Regional Finals will be run by MultiGP and announced by Joe Scully. When considering the scheduling of these Regional Finals the regions climate will be taken into consideration. As an example warmer Regional Finals locations will be held earlier in the season while Regionals Finals locations in cooler location will have their events held later in the season. The top 100 pilots from each of the Regional Standings Lists qualifies for an invite to the Regional Finals. A maximum of 100 pilots for each Final. Regional Finals will also be multi-day events. Allowing enough time to hold both fair and competitive events efficiently. Pilots from the Regional Series can also qualify for the National Championship. A maximum of 151 pilots are invited to the National Championship. These 151 spot are determined through five qualification methods. The previous year’s champion will be invited to defend their title. This invitation allows the Champion to participate in the National Championship without attending any regional qualifier or final. Automatically advances to Fast 57 round. The top 6 pilots from each regional final will be invited to participate in the National Championship. They will automatically advance to Fast 57 round. Ranks 7-12 from each regional final will be invited to participate in the National Championship. These 36 pilots will compete with the List and Wildcard pilots for 20 advancing slots. All the regional final participants ranked 12-100 at their respective regional final will be placed on The List. The top 72 pilots on The List will be invited to participate in the National Championship where they will compete with the Contenders and Wildcards in an on-site, best 2 of 3 rounds, race. The top 20 from this race will advance to the Fast 57 round. 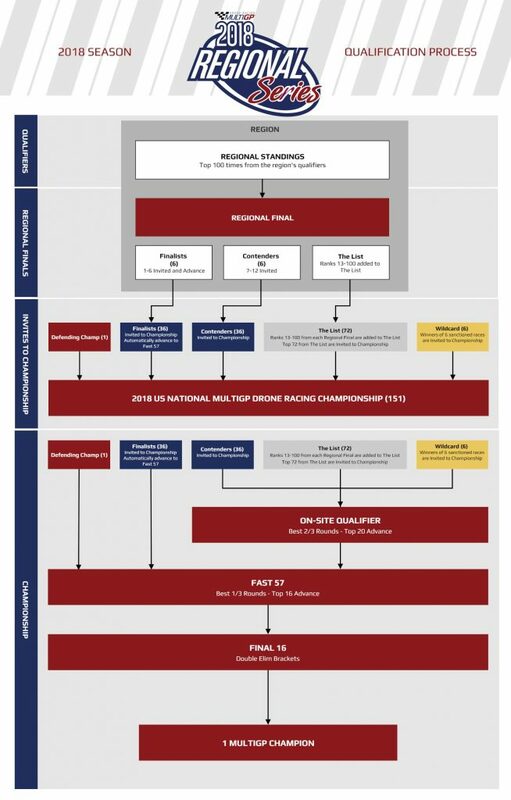 6 wildcard qualification slots for the Championship will be assigned to 6 sanctioned races throughout the year. These 6 slots will race with the pilots from The List and Contenders in an on-site, best 2 of 3 rounds race for the 20 advancing slots. Chapters in a region are allowed to run only one Regional Qualifier. This Regional Qualifer by a race chapter is voluntary. Pilots are not limited iin the number of Regional Qualifiers they can compete in within their region. Offering more opportunities to qualify. Chapters choosing to run a Regional Qualifier must use the specified Regional Qualifier Track. This will be a pre-designed track that all Regional Qualifiers will take place on. This track will be set up by the individual chapters according to the Regional Qualifier Track Setup Sheet and verified via the Track Dimension Worksheet. Pilots competing in Regional Qualifiers will then have their standings entered into the Regional Standings List. Every participant in a regional qualifier will be added to the Regional Standings List for that Region. The top 100 pilots from each Regional Standings List will advance to the Regional Final. The Regional Standings are seeded by the best 3/5 rounds. How to qualify for the 2018 MultiGP Drone acing National Championship? The 2018 National Championship will begin with the pilots who make up The List, competing in a best 2 of 3 rounds, race. The top 20 from this race will advance to the Fast 57 round, joining the Defending Champion and the Finalists. The Fast 57 participate in a 3 round qualification race to determine the Final 16 that advance to double elimination brackets. The Final 16 then compete in the double elimination brackets until the new National Champion is determined. 2018 is shaping up to be an exciting MultiGP Drone Racing 2018 Regional Series Season and hopefully a great year for drone racing. 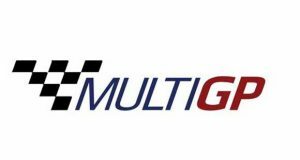 MultiGP Drone Racing 2018 Regional Series Season. Be sure to visit the Racing Drone World YouTube channel and give us a like, comment, and or subscribe to our channel. 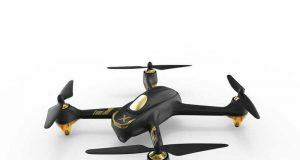 discuss on Drone Racing what is it?